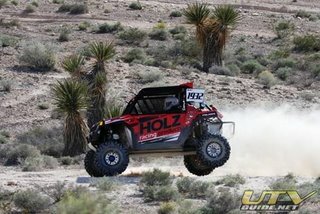 Holz Racing topped the field in the grueling Best in the Desert Series during the Terrible Town 250 in Primm, Nevada, April 18, 2009, adding cross-country durability to the already long list of Holz Racing Products attributes. To date the 2009 Holz Racing Polaris RZR had already proven itself on the short track World Off-Road Championship Series (WORCS) races, winning two of three events. But with 73 miles of un­tamed desert looming on the horizon, owner Mark Holz teamed up with Matt Parks and stretched the legs of the Kroyer Racing Engine powered RZR in the Best of the Desert UTV class. Fourteen competitors comprised the UTV class at the start of the Ter­rible Town race with only 11 cars making it to the checkered. Faced with uncharted desert, dry creek beds and rock-strewn climbs, the Maxxis tires outfitted Holz RZR averaged just over 39 miles-per-hour, finishing the race in just over 1 hour, 52 minutes. The next race for Holz racing is the May 1-3 World Off-Road Championship Series (WORCS) in Milford, California. For the past 10 years, Holz Racing Products has engineered and extreme tested the finest quality, most effective performance parts available for UTV, ATV and snowmobile applications. Manufactured in the USA and race tested around the world, HRP leads the field in Polaris RZR accessories and performance products. For more information visit their website at www.holzracingproducts.com or call 360-398-7006.